For my weekly Wednesday after work run I changed things up a little bit. 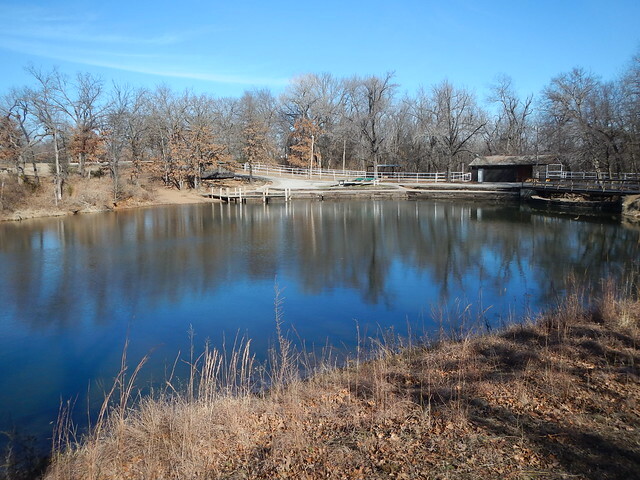 Instead of going to Turkey Mountain with its rocks, roots, and hills I headed out to the best kept secret trails in Tulsa, the Northwoods trails at Oxley Nature Center and then extend it by running around one of Tulsa’s raw water supply sources, Lake Yahola. 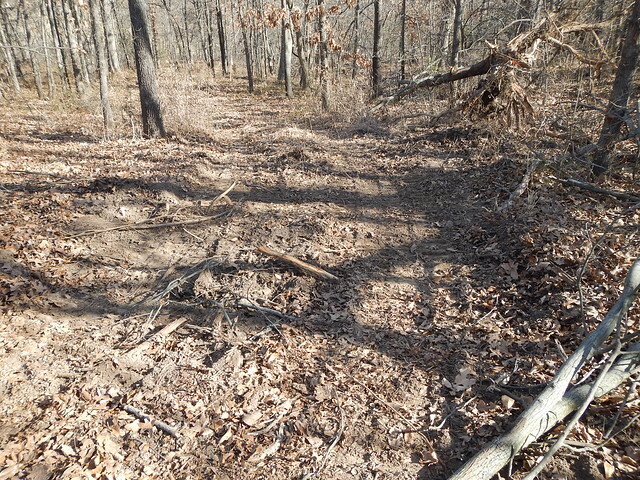 The Norhwoods trails are not used very much. They don’t even have a parking lot. You just park on the side of the road. I hardly ever see anybody else on them. And there is a chance of seeing deer. I haven’t seen a deer on Turkey Mountain in a long time. The thing about Oxley is that there are very few rocks and no hills. 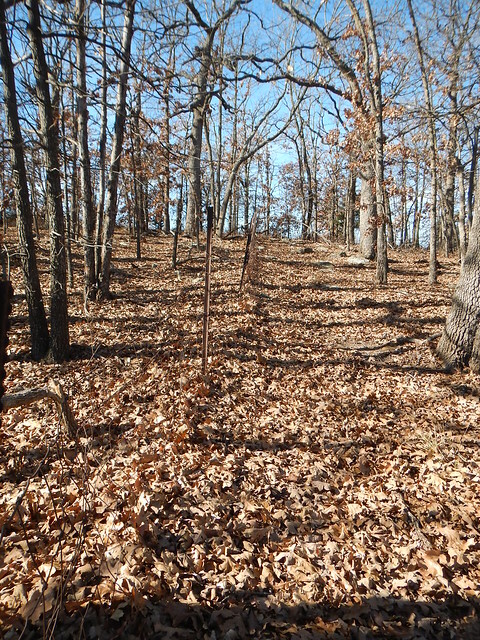 My legs were a little sore and I wanted some distance but I couldn’t face going up and down the hills of Turkey Mountain. 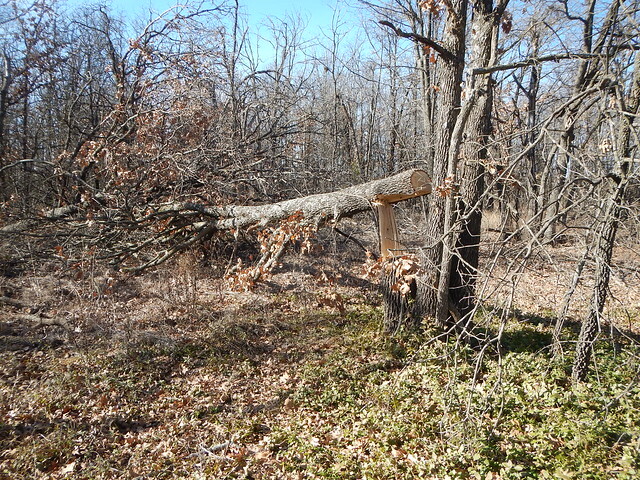 I did find an old snag that toppled across the trail. 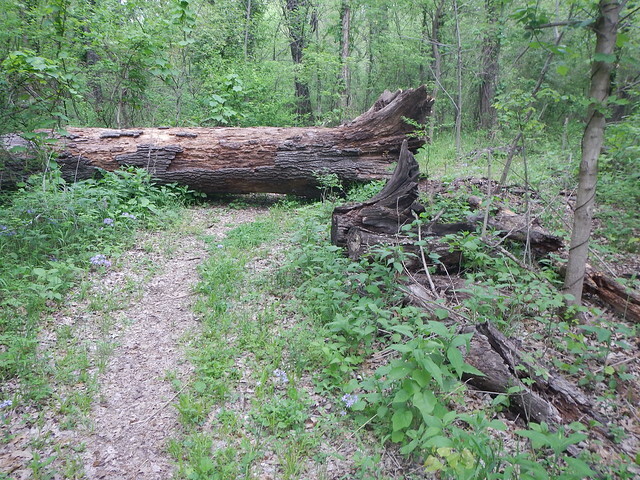 A real trail runner would have leaped across it without slowing down. Then there are guys like me who deal with in a different manner. 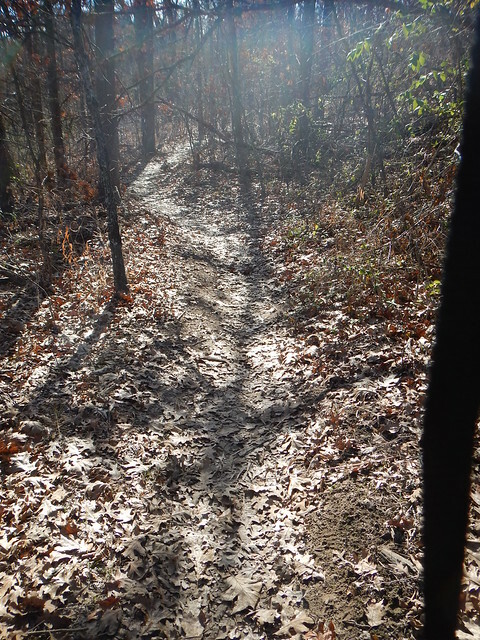 There is quite network of trails in the North Woods section but they only add up to 3 miles and they loop around on each other so if you miss a turn it is no big deal. So I took the Oxbow lake Trail to get to Lake Yahola. And here it is. 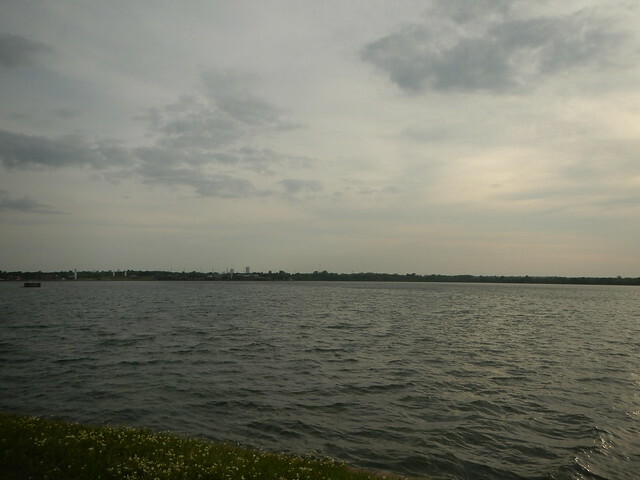 See the little specs to the left of center on the far shore? That is the high rises of downtown Tulsa just a few miles away. I turned to the right and started running on the chat gravel path. I didn’t bring my trail shoes and the gravel was hurting my feet and the grassy part was too soft for really good running. What a cry baby I am!!! I was running into the wind also but I was having the time of my life. I come upon about a dozen fishermen scattered around the lake. There is something peaceful about fishing and watching fishermen. 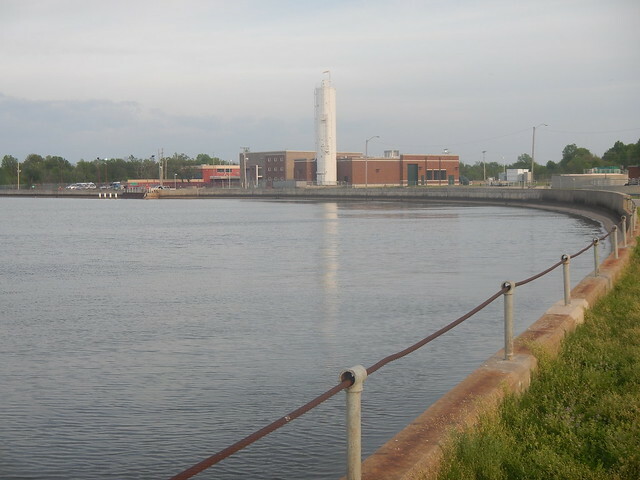 About two thirds of the way around the lake I come upon the city water treatment plant. I love infrastructure stuff like this. 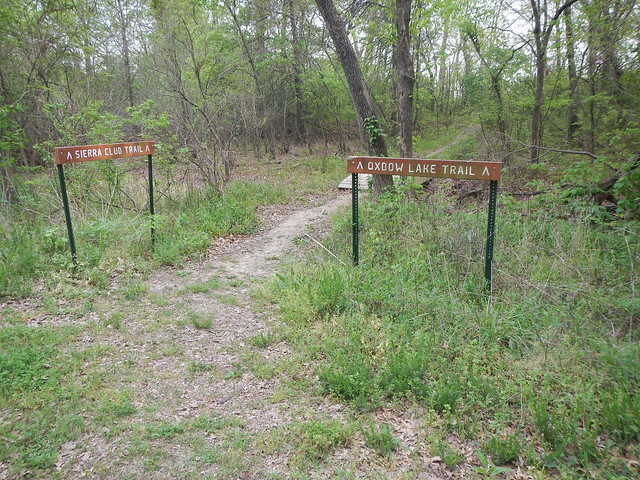 Back close to the main trail at the Oxbow Lakes. 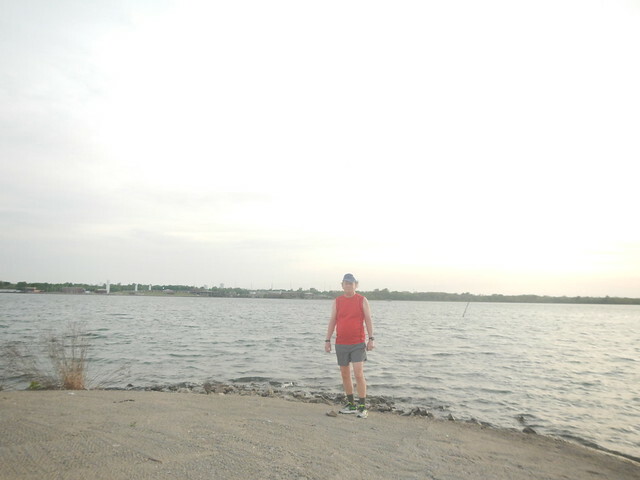 Fuzzy pic of me with the lake. Do you like my socks? Back down to the road. 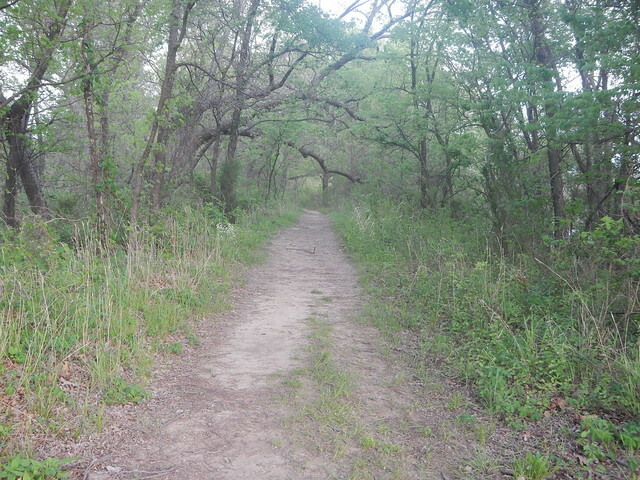 I love how the trees tunnel over the trail. 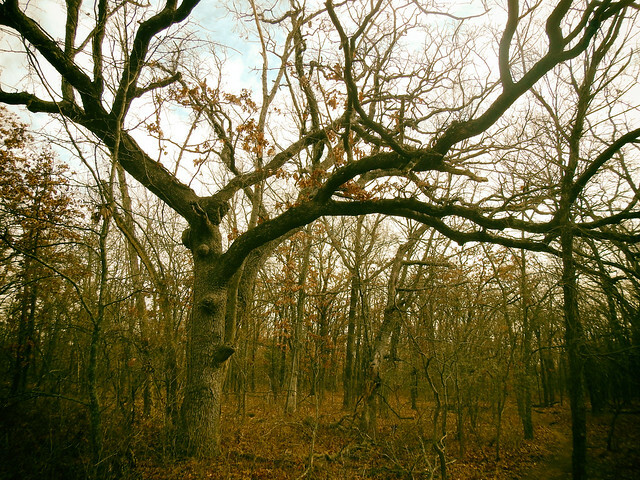 I love running here when there is strong winds because the trees just plain stop the wind and it is neat because you can hear the wind howling through the tops of the trees. I love stuff like that. Got my run in. Almost six miles at a leisurely pace. Oh well, it is what it is. 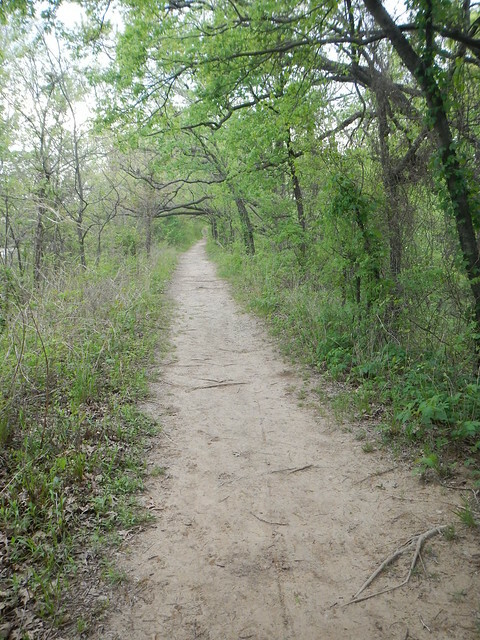 This entry was posted in Our World Tuesday and tagged Lake Yahola, Oklahoma, Our World Tuesday, Outdoors, Oxley Nature Center, Running, Trail Running, Tulsa on April 15, 2017 by Alan Bates. I’m such a slacker. 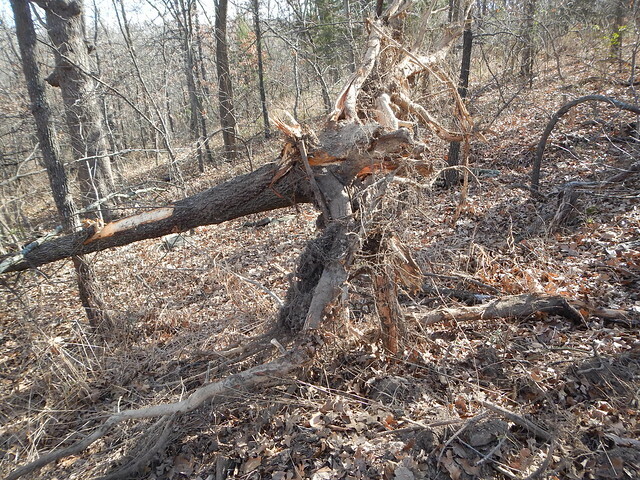 The Tulsa Urban Wilderness Coalition held a very successful cleanup on Turkey Mountain today (Saturday). I didn’t make it because I took son to his horseback riding lessons and then to his Improv class. I went by the main parking lot at Turkey Mountain over an hour late and it was cram full. So I drove up close to where Simon Property Group is planning to put their “Upscale Outlet Mall” (Whatever that is) and took off with my camera. I started at the natural gas pipeline right of way. 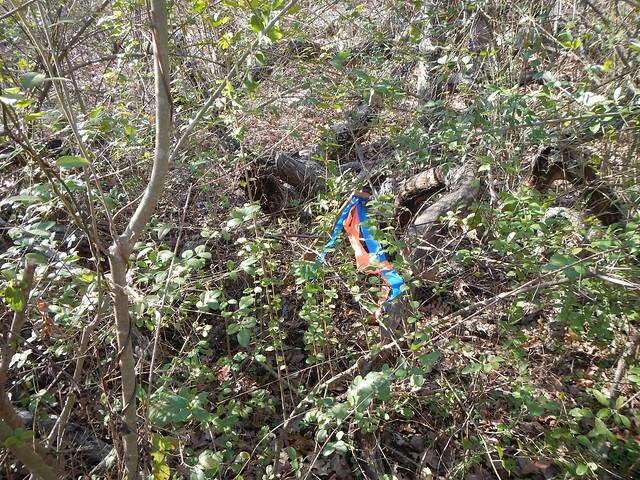 The pipeline had been marked. This is a safety procedure. Generally anywhere in the country if you are going to dig or drill or do anything that might affect underground structures, you call a number. In Oklahoma it is” 1-800 Call Okie” and tell them where you are going to dig or drill and anybody who has underground utilities will send someone out to locate their lines. It keeps everybody safe. 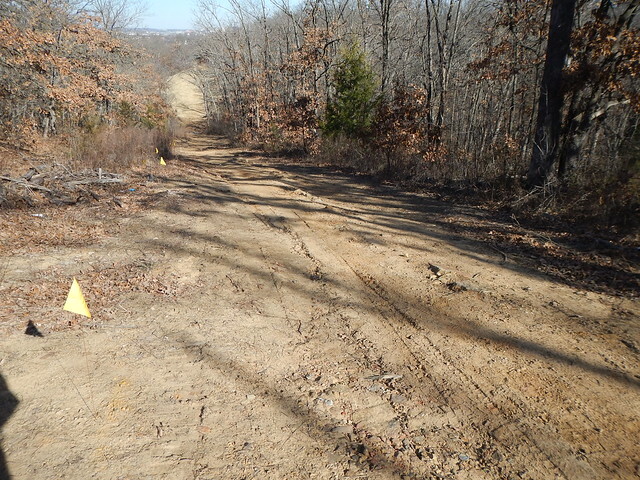 So anyway the pipeline company located the line and cleared out their right of way a little bit. I wandered around and found where the contractors hired by Simon Property Group had moved their equipment in. I have to tell you that this is somewhat of a “me to” post as two excellent bloggers have already told this story. 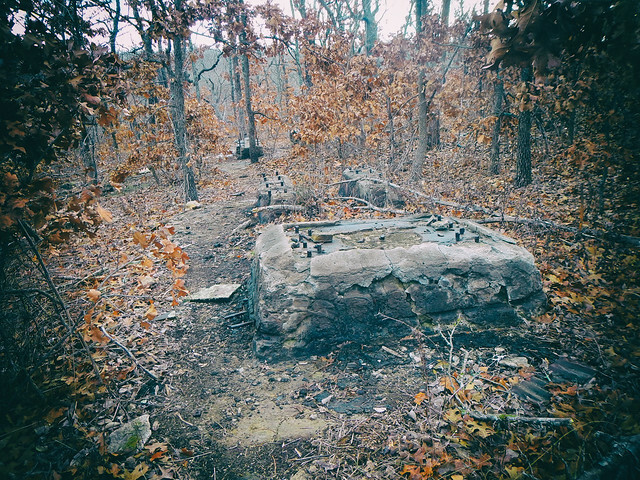 Ken, aka “Trail Zombie” one of the leaders of Tulsa’s thriving trail and ultra running community has posted on …..miles to go before I sleep… as well as Bob Doucette who has a great outdoors oriented blog proactiveoutside, Check them out. They both bring a lot of passion to the situation on Turkey Mountain. I followed the track and found some of what I would call gratuitous damage. Damage that was done for no purpose. Keep in mind that this is not public land, it is private land so I guess they can do whatever the landowner will stand for. 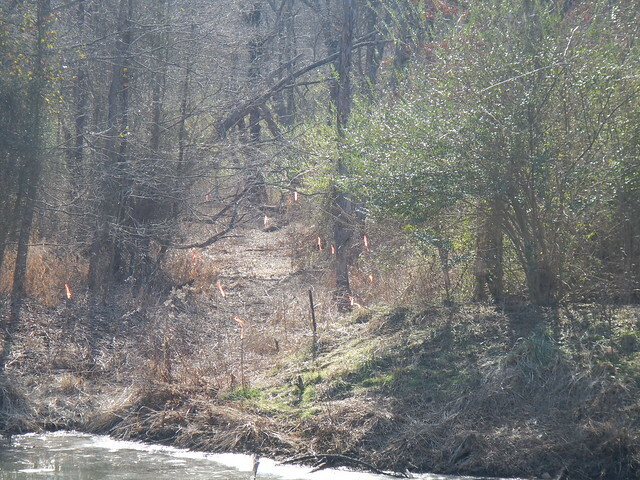 Still, I spent years building pipelines all over Texas, Louisiana, and Mississippi and I never met a landowner who would stand for this kind of damage during the survey process. 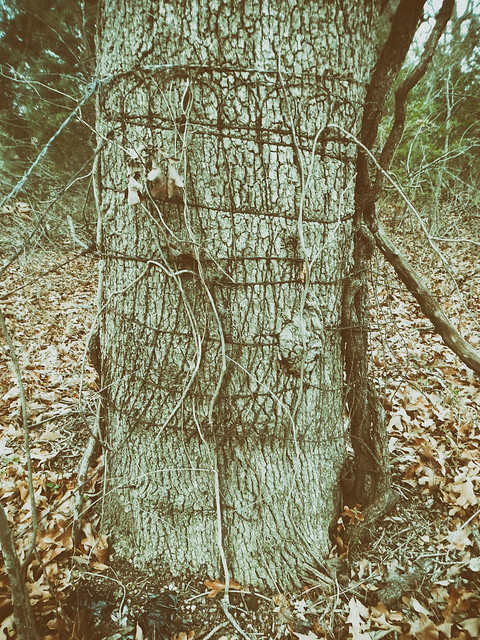 This tree was documented by both Trail Zombie and Bob. 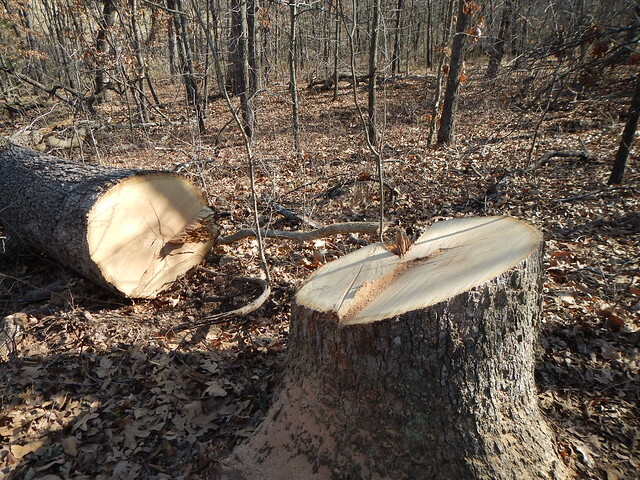 TZ measured it at 31 inches across. It seems to me that it was cut down just for the fun of it. 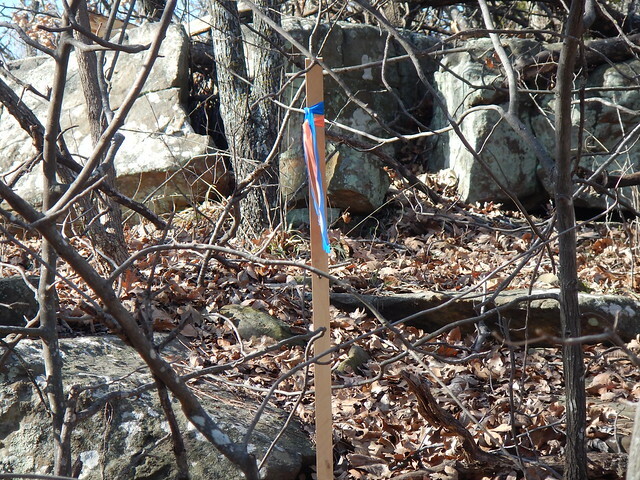 These survey sticks with the ribbons seem to be where they are drilling for cores. 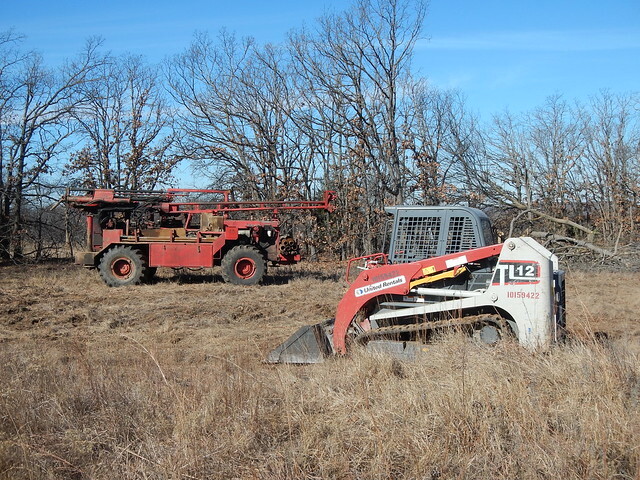 Here is the core drilling rig and the Bobcat used to clear the path for the rig. They were taking the day off on Saturday. Or what the heck maybe the crew was participating in the cleanup. A closeup of the drilling rig. 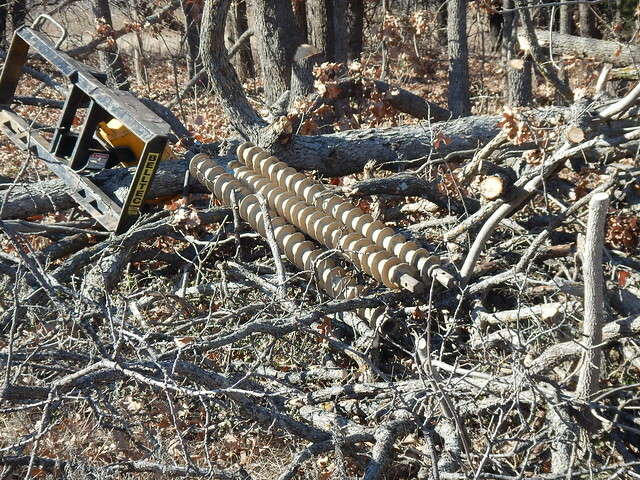 And some other equipment in the brush. 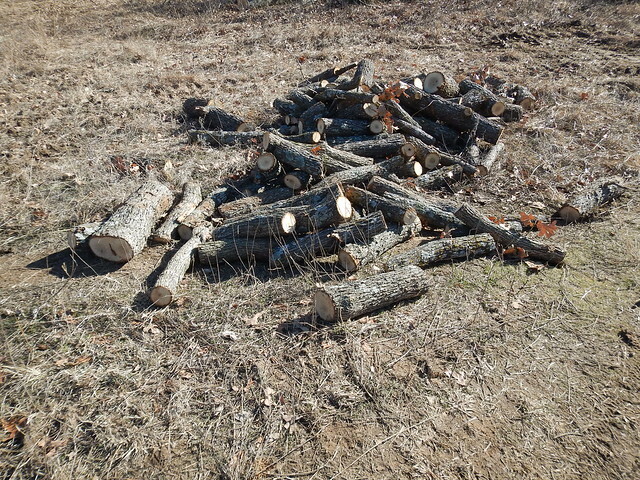 And some logs cut into firewood length. 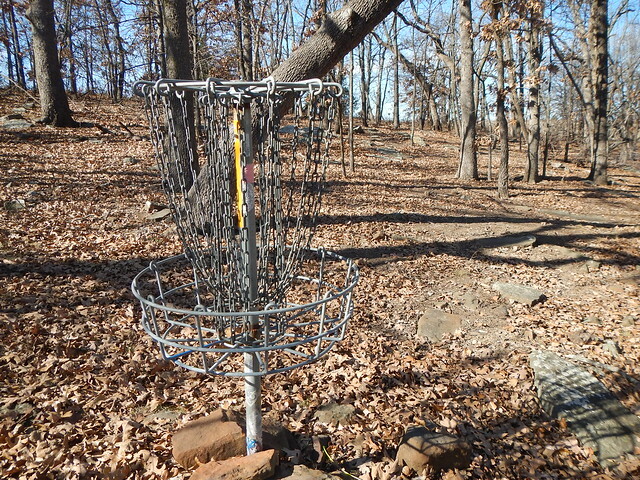 After a while I came to the northernmost basket on the Westside Y’s disk golf course. Right nearby were these three sticks together. 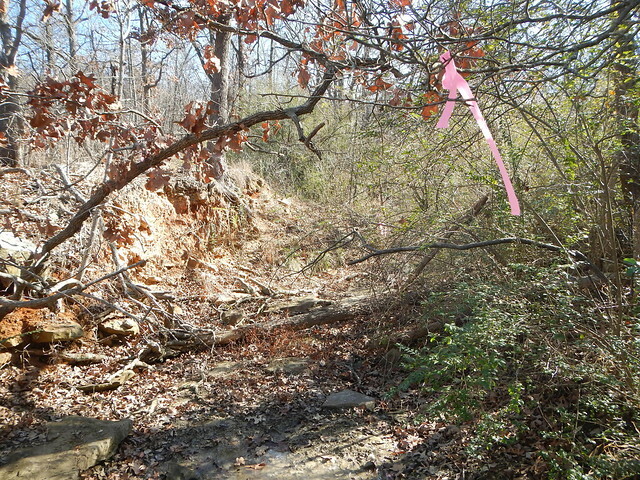 I wondered if this might be the northern boundary of the proposed mall property. 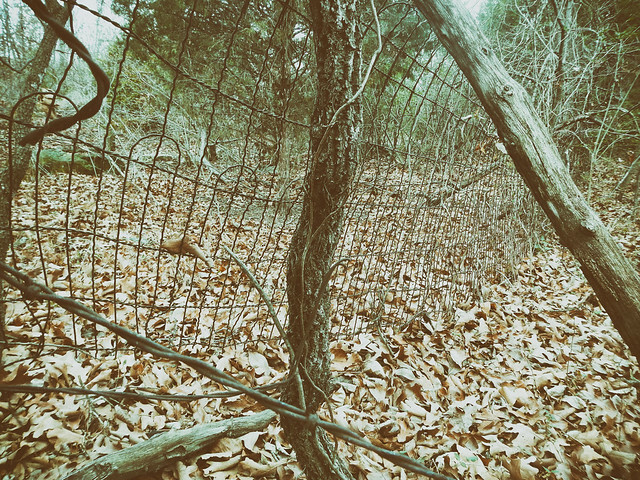 Right adjacent to it was this ancient fence line. I ventured further to see if I could find any other damage. I didn’t see any and eventually came upon the edge of the Westside Y proper. 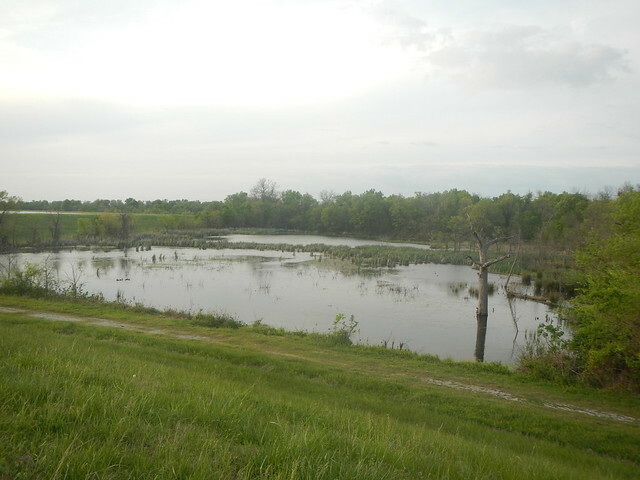 This is Lake Logan. Backtracking, these ribbons caught my eye. 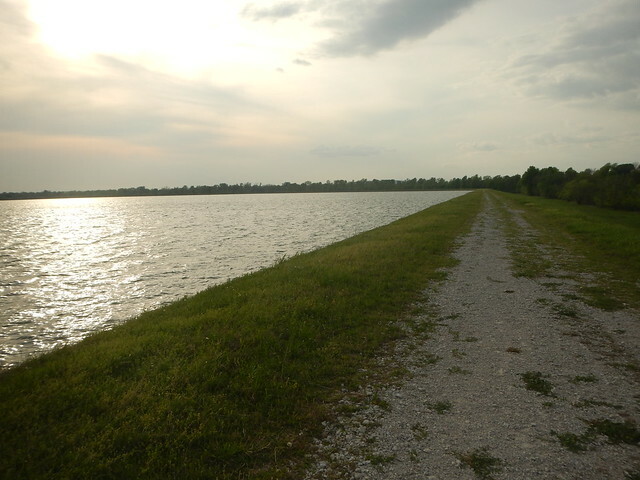 They were marking the waterway that feeds Lake Logan. I followed them upstream for quite a ways. I’m guessing it was well marked to make sure they didn’t get their equipment didn’t get in there. What I’m afraid of is that all the construction upstream would cause a lot of runnoff into the Y’s lake where they have a popular day camp in the summer. 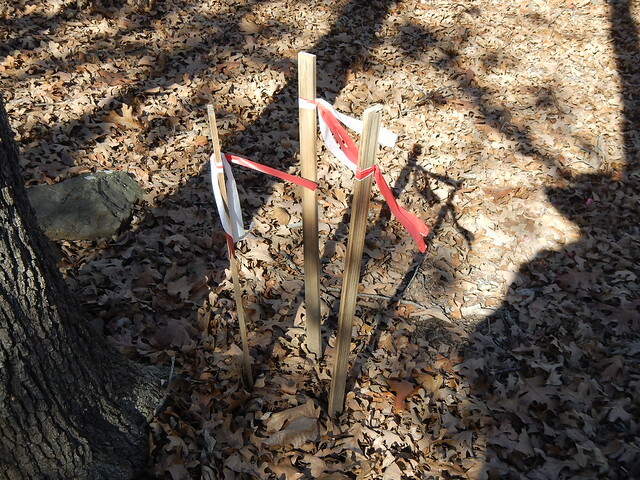 As I followed the waterway I saw some of these survey stakes very close to the water course. 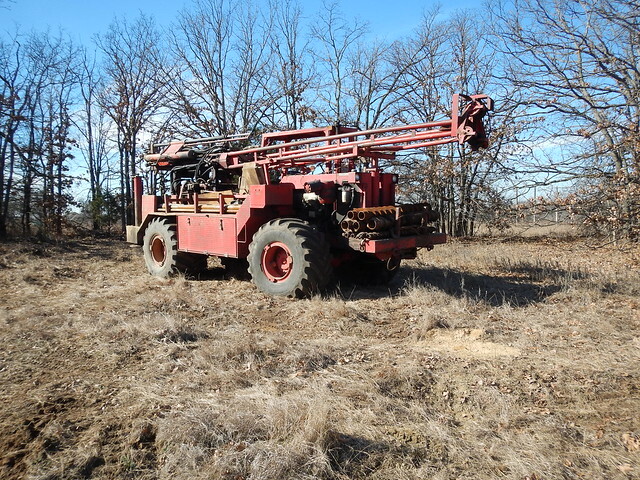 I’m anticipating that very soon the Bobcat will be clearing a trail down to the creek in several places so that the drilling rig can take some core samples. 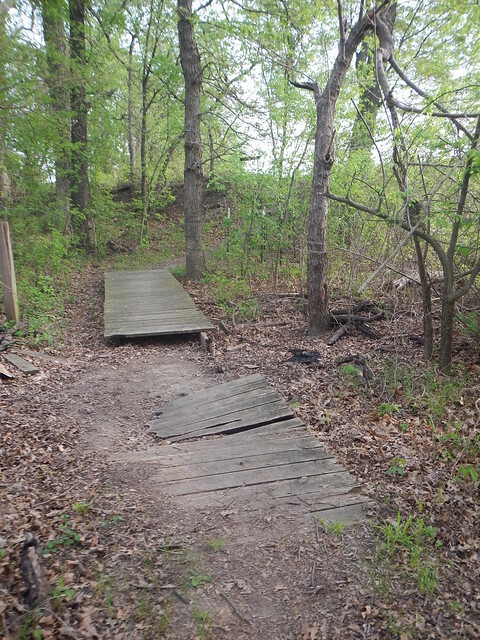 If Simon Property Group is allowed to build their mall then this trail and others in the area are going to not be there any longer. Find out who your Council Member is and tell them what you think. 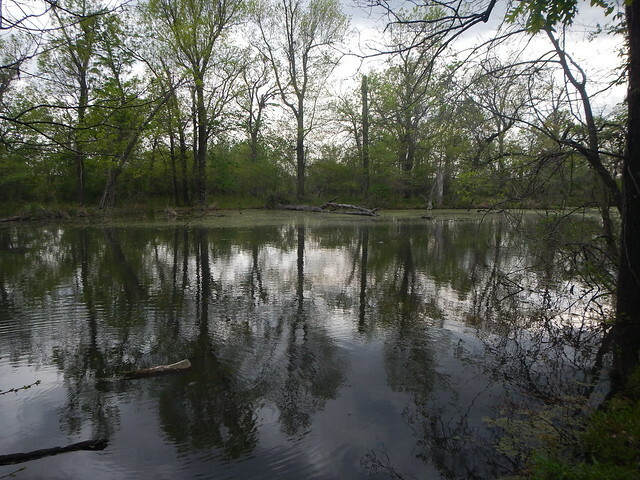 Question: If it is private land can’t the landowners do whatever they want with it? Sure, especially in Oklahoma. It is anticipated though that they will want special tax breaks and subsidies for the infrastructure needed plus improved roads to the site. Simon Property Group is a very wealthy company. If they want to build a mall while spoiling a major part of Turkey Mountain then I don’t want to subsidize them with my tax dollars. 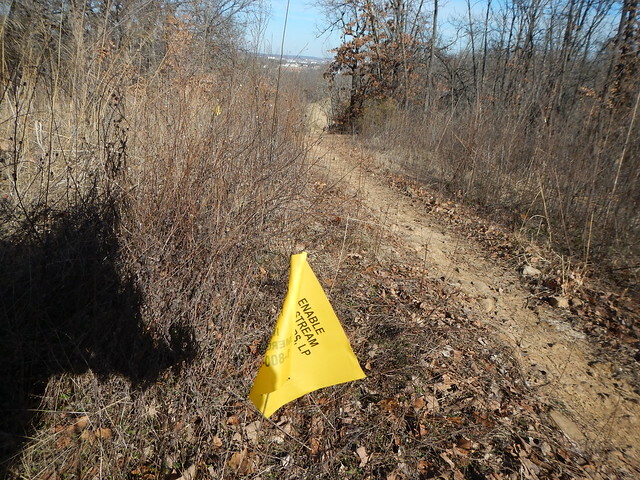 Question: Should the landowner be expected to continue to provide the land for the trails for free? Of course not. Tulsa needs to buy the land and other tracts not already owned by the city or the George Kaiser Family Foundation if it is to be protected long term. Where will the money come from? I don’t know. I do know that things that are a priority get funded. Question: Am I against outlet malls or against development? No I am not outlet malls. I think Turkey Mountain is the wrong place to put one. My preference would be to put it somewhere where it doesn’t affect outdoor recreation. I also think Simon Property Group is a responsible company. They own and operate Woodland Hills Mall near where I live. 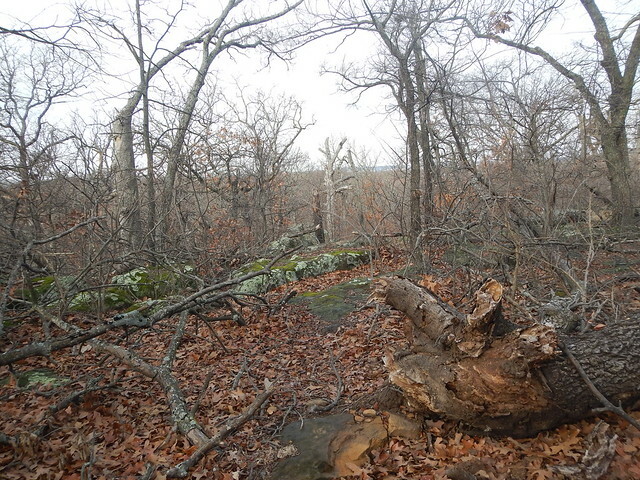 I don’t think they are making a good choice by pursuing the Turkey Mountain site. This entry was posted in Turkey Mountain and tagged Outdoors, Outlet Mall, Turkey Mountain on January 17, 2015 by Alan Bates.